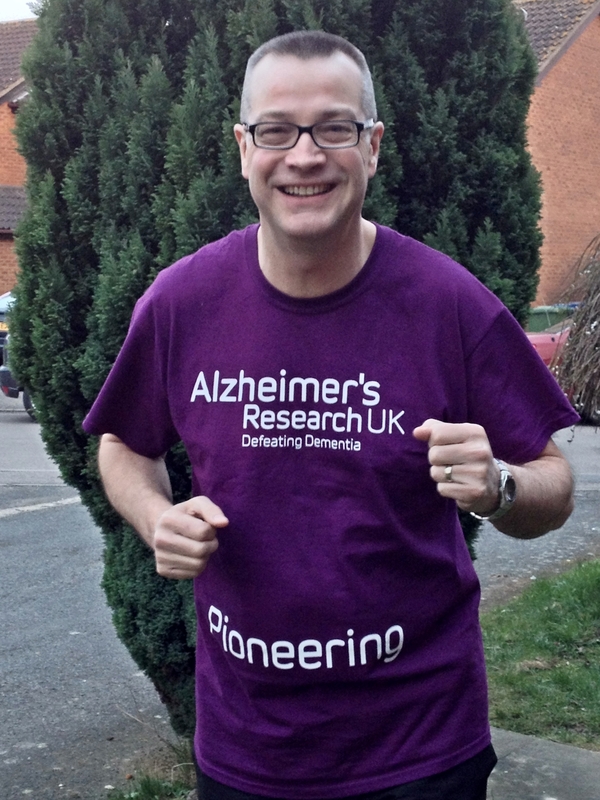 Chris Drummond from Milton aims to raise £2,000 to boost funds for Great Abington-based charity Alzheimer’s Research UK, when he takes part in the Virgin London Marathon on 21 April. Running among a crowd of over 37,500 people, Chris will pound the capital’s streets alongside fun runners, amateur athletes, elite sportsmen and women as well as a host of celebrities. He is determined to complete the gruelling 26.2 mile course in memory of his mum Dot who died with Alzheimer’s disease seven years ago, aged 84. “When my dear mum was diagnosed with Alzheimer’s I was shocked to learn there was very little that could be done to help her. I had no idea that research to find new treatments is so underfunded. Running the London marathon gives me an opportunity to do my bit and raise money for the experts, Alzheimer’s Research UK. “Mum worked hard all her life and didn’t retire from her job as an accounts clerk until she was 70. She was diagnosed with Alzheimer’s a year before she passed away but it had been creeping on for some time. I first realised something was wrong was when she couldn’t remember how to make her special cauliflower cheese. Then I noticed other things – she forgot how to change TV channels and how to answer the phone. She deteriorated quickly, losing her dress sense, preferring to sleep in the armchair all night, fully clothed, rather than go to bed. It was very distressing and frustrating. “Chris is incredibly supportive of our work at Alzheimer’s Research UK. We can’t thank him enough for taking on this exhausting challenge again to support our world-class research. We wish him every success. “Last year our Virgin London Marathon runners raised an amazing £150,000 – enough to pay for five pioneering dementia research projects. Every £20 raised by Chris will pay for another vital hour of research, bringing us closer to finding ways to diagnose, prevent, treat and cure Alzheimer’s disease and other forms of dementia. To help Chris raise funds for Alzheimer’s Research UK’s crucial dementia research, donate online at virginmoneygiving.com/ChrisDrummond. To find out more about fundraising for the charity contact fundraising@alzheimersresearchuk.org or call 0300 111 5 777. Tagged charity. Bookmark the permalink.